It was so wonderful to work with you. The proposal came off as smoothly as I could have dared hope. Thanks for all your efforts from conception through execution! Everything was absolutely perfect. You really made me feel special and taken care of. It felt like it was just the two of us...It was just a perfect moment that I thought only existed in movies. None of it would have been possible without you and the efforts of everyone on you team." Mike, a visitor, on proposing at WaterFire. joy & art to the special moments in your life. 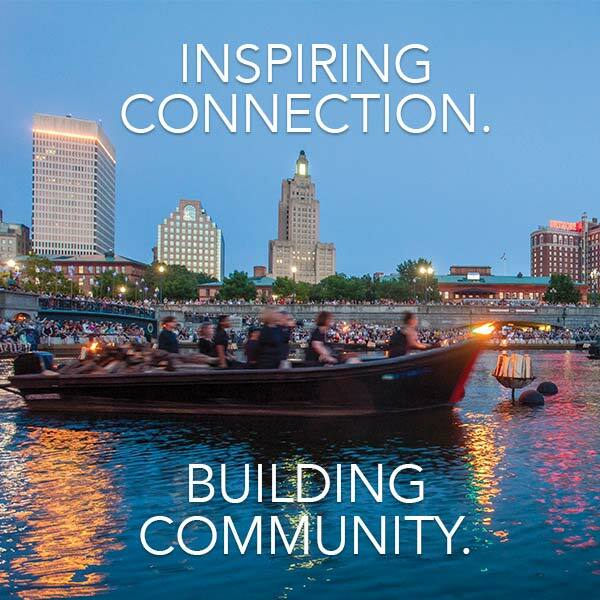 WaterFire Providence works with visitors to create extraordinary memories at the installation. Incredibly romantic marriage proposals, unforgettable dates for couples; whimsical birthday celebrations; fun wedding observances; and moving memorial tributes are some of the ways you can celebrate at WaterFire. Use our inquiry form and get started planning today. Or email us directly at celebrate@waterfire.org. Please note: All Celebrate Program inquiries must be submitted a minimum of 2 weeks prior to desired event date. We can create a signature, once-in-a-lifetime event for you! Anniversaries, Birthday Celebrations, Christenings, Commemorations, Employee Recognition, Engagements, Funeral Observances, Graduation Celebrations, Marriage Proposals, Memorials, Romantic Date Ideas, Torch Processions, Vow Renewals, Weddings…and many more! You and your guest will enjoy a guest boat ride through the fires and gain a one-time access pass to our exclusive reception tent. Enjoy a wonderful evening with great hors-d’oeuvres and drinks in an intimate environment. Float among the flames, relax and enjoy Providence from a different point of view. This unique and exciting experience will certainly make your night one to remember! Inspired by Van Gogh’s Starry Night painting, WaterFire Providence’s Starry, Starry Night installation, located in Memorial Park, inspires visitors to dream big and share their wishes with the world. We will create a special arrangement of 20 luminaria candle lanterns in celebration of your special moment. It will begin with a path of 10 luminarias among the stars of Starry, Starry Night, each lantern will be marked with a carnation and a pre-written special message by you. This path will lead to a circle of 10 luminaria candle lanterns, also marked with your personalized dedications. Hanging above the center of your circle will be a luminous blue star bearing your special pre-written wish upon a white satin ribbon. The carnations and a gift-wrapped star will be yours to take home at the end of the night as a keepsake. Share your most cherished life memories with WaterFire Providence’s luminaria dedications. Among the grove of trees in Memorial Park float hundreds of shimmering blue stars with luminaria candle lanterns flickering beneath them. We will work with you to create a special surprise to share with your loved one in Starry, Starry Night. Arrange a path of up to 10 luminaria candle lanterns, pre-set in your choice of arrangement, with pre-printed dedication card messages, and 2 pre-written white wish ribbons each hanging on a star among the constellation. Your wishes will be displayed at each Starry, Starry Night installation throughout the 2019 season. Within a beautiful field of wishes illuminated by blue stars lie the dancing flames of paper candle lanterns that create a romantic and unforgettable memory. Take a walk with your loved one amongst the trees in an enchanted, intimate atmosphere and share your memories. We will pre-set 2 pre-written luminaria dedication cards and hanging above on a blue star will be 1 pre-written wish on a white satin ribbon. Interested in celebrating at WaterFire Providence in 2019? Prices will be based on selected package and available upon request. Packages are customizable and many more embellishments are available. *Prices of this package may vary depending on: the number of guests, date of lighting, choice of menu, etc.